Who will find the route useful? Curious people, both young and young at heart, who are looking for a varied programme as well as Berliners and visitors who want to see something new. When is the route most useful? Every day, although it’s nicer when it’s not raining. Cost? Depends on what you choose to eat. Otherwise, the cost of an AB day pass on Berlin’s transport network and admission fees. The tour gets started at 9 o’clock at the Admiralbrücke in Kreuzberg. The somewhat bumpy Uferweg will take you along the Landwehr Canal to Kaffee A.Horn (Wheelmap.org) for a delicious breakfast to start the day. 10:15 Take the M41 from the nearby Urbanstraße/Baerwaldstraße stop to the Potsdamer Platz S- and U-Bahn station (11 minutes). 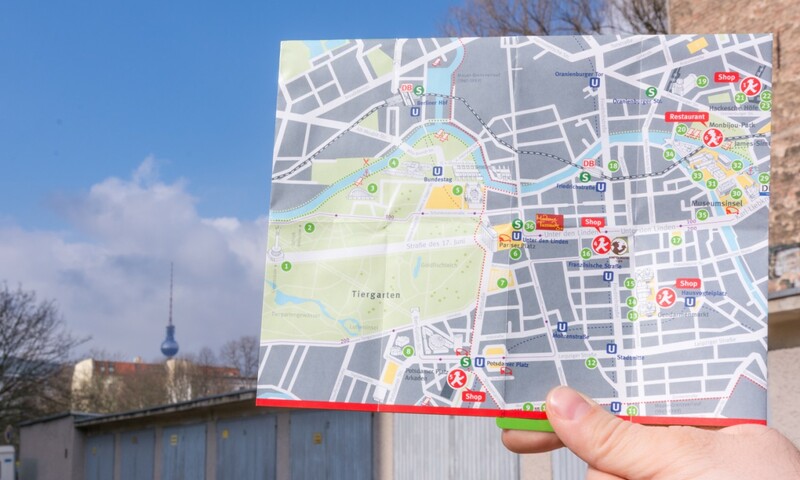 There you can ascend 100 metres into the sky and enjoy the views over Berlin at Panoramapunkt (Wheelmap.org). 11:00 Hop on the M41 bus towards Sonnenallee/Baumschulenstraße for one stop and get off at Abgeordnetenhaus. The nearby Martin-Gropius-Bau (Wheelmap.org) hosts a continuously changing series of art exhibitions. The building is wheelchair accessible, has lifts and wheelchair-accessible toilets, and the café is also reachable without any steps. 1:30 Hop on the M41 bus back to Kreuzberg, getting off at the Gräfestraße stop (journey time about 15 minutes). Die Weltküche (Wheelmap.org) is a restaurant offering dishes from around the world at very reasonable prices. It is operated by the non-profit Gräfewirtschaft association, founded and run by migrants to the German capital. There are steps at the entrance, but a ramp is available. And once you’re inside, there is also a wheelchair-accessible toilet. 3:00 After lunch: Take Gräfestrasse towards Urbanstraße and turn into Hasenheide. Passing the mini-golf course and petting zoo, stay on the main path towards Columbiadamm (about 900 metres, with an incline). At the end of the main path, cross Columbiadamm and head onto the pathway to Tempelhofer Feld to your left next to the entrance to the Sommerbad. Tempelhofer Feld is the former Tempelhof airfield and is now a public space shared with kite surfers, cyclists, walkers and urban gardeners: a space that’s truly unique to Berlin. 4:30 Take the Herrfurthstraße exit from Tempelhofer Feld. Now we’re heading over to the trendy Schillerkiez. On Herrfurthplatz, check out Mo’s Eisley (Wheelmap.org) offering extraordinary ice cream delights, especially great on a warm summer’s day. Head to the Boddinstraße U-Bahn station (but do not enter) and take bus 104 from there towards Eichenstraße/Puschkinallee. In about six minutes, get off at the U Rathaus Neukölln bus stop. At the intersection of Karl-Marx-Straße and Flughafenstraße, it’s time to head up again to the rooftop terrace of the Klunkerkranich (Wheelmap.org) in the Neukölln Arcaden! Take the lift to the 6th floor, then a ramp will guide you to the bar. This is a great spot to chill, enjoy the atmosphere, drink something refreshing and have a snack as you enjoy relaxed electro music or the events offered by the bar with fab views above the city’s rooftops. 8:00 Looking for something alternative to do to end the night? Then head over to Südblock! Cross Karl-Marx-Straße and turn into Fuldastraße where you’ll catch Bus M41 back towards Hauptbahnhof. Get off at the Körtestraße stop. Then head right into the leafy Grimmstraße, across the Admiralbrücke over to Südblock, a colourful venue dedicated to the alternative scene and always full of surprises. The programme features concerts, parties and readings until the wee hours. 9. Südblock, Admiralstr. 1-2, 10999 Berlin-Kreuzberg.